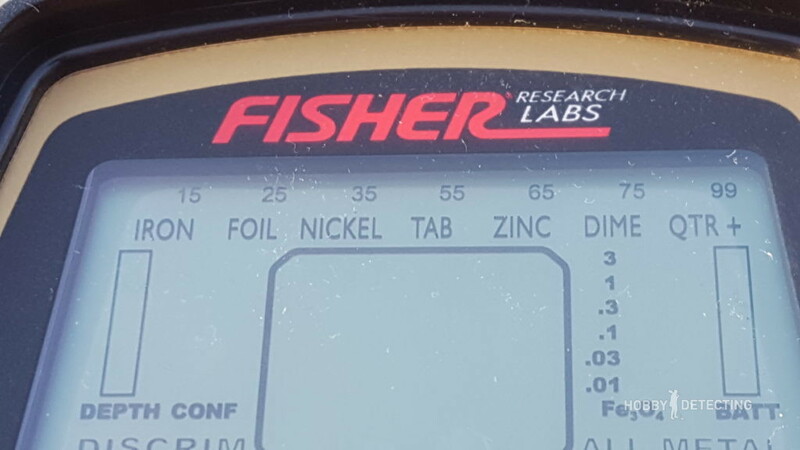 The Fisher F75, the flagship metal detector of Fisher Research Labs, is a professional level detector. This detector has a great design, impressive technology and it is overall an amazing detector that is in no way inferior to the more expensive models of other manufacturers. 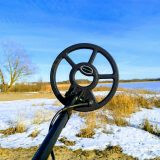 I have now owned this metal detector for quite a long time, and I truly am happy for buying it. 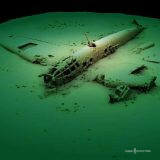 With it, I have detected everything from rings and silver coins to WW2 relics. So I can with confidence say that I have a lot of experience with it, which I now will happily share with you! As always, let us start off with some specifications and characteristics of the detector. As most top metal detectors on the market, the Fisher F75 is based on the “VLF”. This stands for “Very Low Frequency”, and is the most common one. 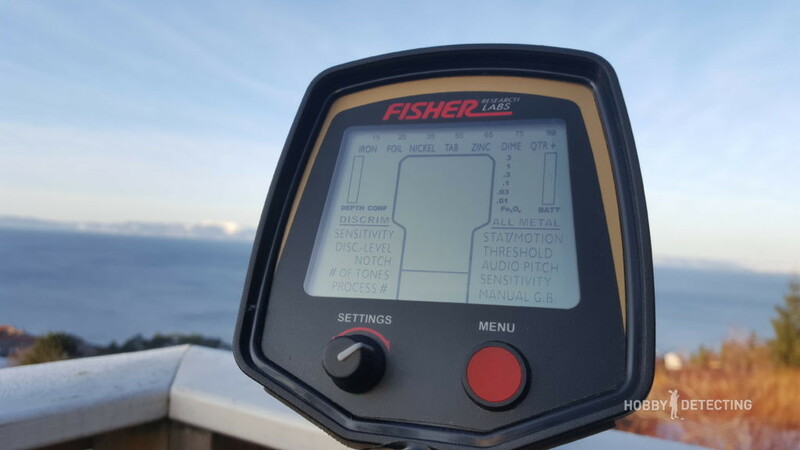 The Fisher F75 operates on a frequency of 13 kHz, and this is probably the universal frequency for a detectorist, and this frequency works excellent for finding most desired targets. 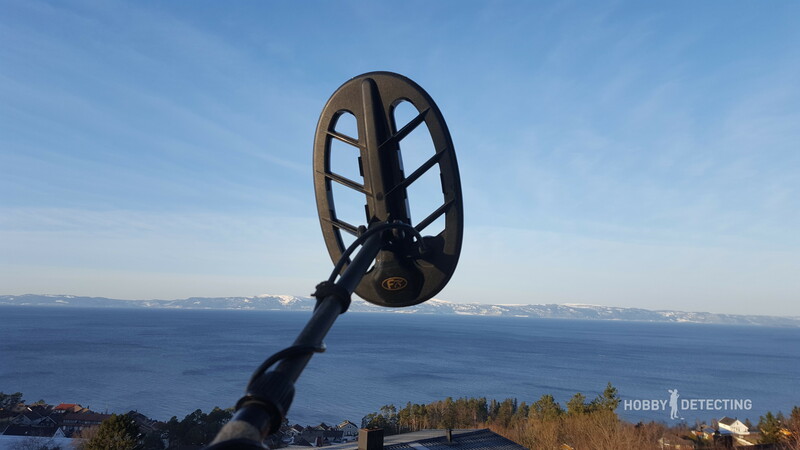 The F75 is a really lightweight detector with its weight of only 3.5 pounds/1.6 kilograms! In addition, it is very good balanced, so it takes very little effort to swing it. I personally can go a whole day with the F75 without getting very tired. 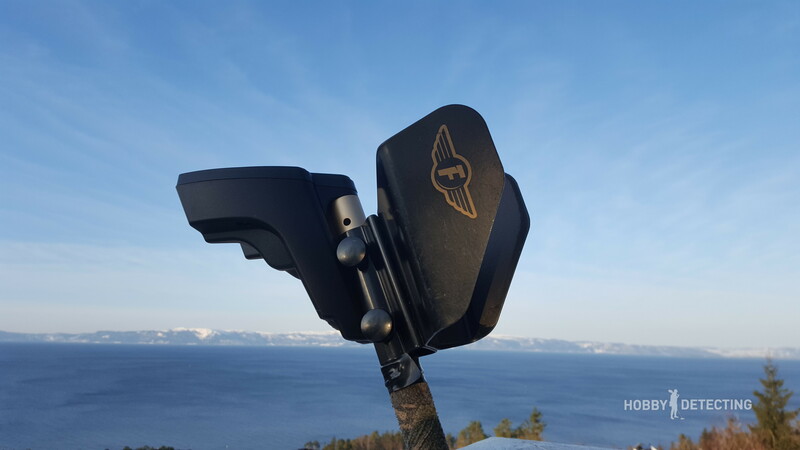 The armrest on the F75 is really convenient and comfortable. You can adjust the width of it by just pressing it together or dragging it apart. You can also adjust the armrest position on the pole itself. Another feature on the F75 that I want to point out, is the trigger switch. If you push the switch forward it will set the detector to ground balance mode, and if you pull it back it activates the pinpoint function. This is quite convenient, and it is much easier and less time-consuming than having a button for it. Although, there is one thing on the F75 that I am not a big fan of, and this is the collar locking system. 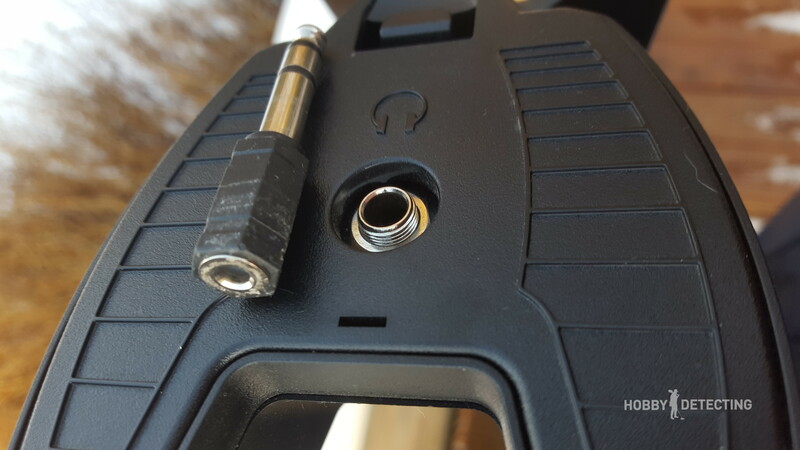 The F75 uses locking collars to hold the stems in place, and to fasten it you have to turn the collar one way and to open it you have to turn it back the other way. 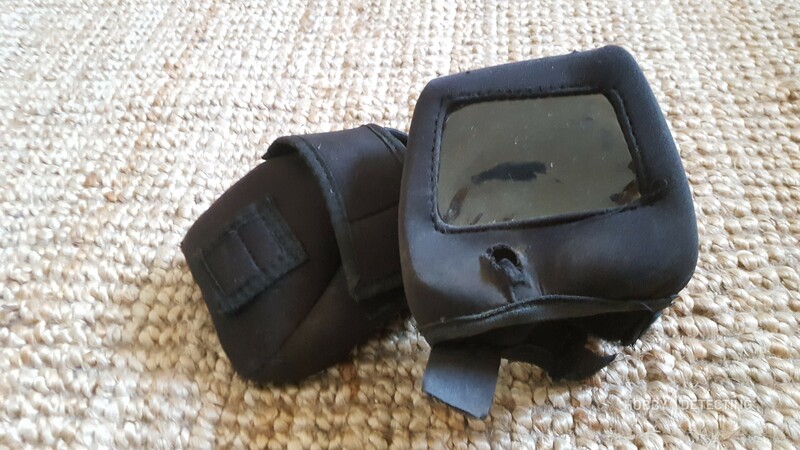 These locking collars are kind of tough sometimes, and after using the F75 for some time, I noticed that some sand or dirt got stuck inside the collars. This made the collars on my detector really tough to turn, so now I use gloves every time when opening and closing them. But overall, I would say that the F75 has a good and “up to date” design, it looks good and feels good in the hand, and it is balanced really well. The F75 requires four AA batteries for operation. I myself use rechargeable batteries, and this works very well for me. The F75 can be used with rechargeable batteries without any problem, so I will recommend it. Especially if you go detecting quite frequently, I will recommend it, because it will definitely save you money! On brand new AA batteries you will get about 35-40 hours of battery life, depending on whether you use the headphones or not. (Using headphones will increase the battery life!) Zinc-carbon and “heavy duty” batteries may not work with this detector, and therefore it is not recommended to use them. As I have already mentioned, I use the rechargeable batteries. Out of my personal experience, you will get about 24 hours of detecting on fully charged rechargeable batteries. Another thing I have noticed is the battery indicator. 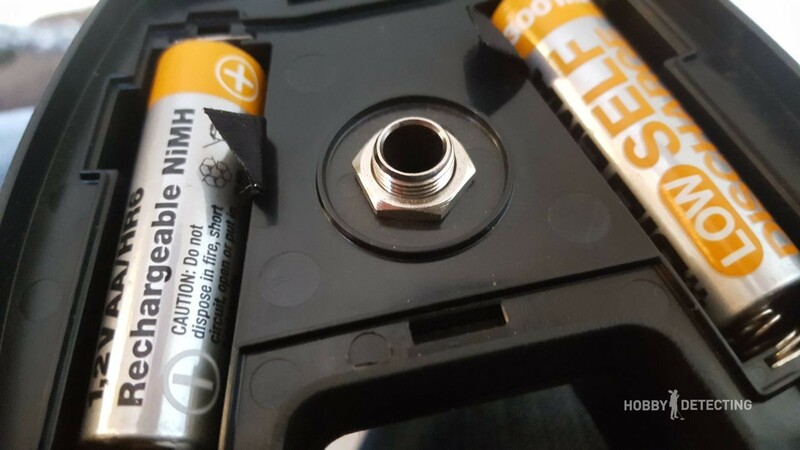 When using rechargeable batteries, the indicator will stay on 2 or 3 bars most of the time. But when it drops to 1 bar, the detector will stop working within a couple of minutes. Therefore I do, and recommend everyone to, carry around spare batteries just in case. This has actually helped me out one time when I forgot to charge the batteries! 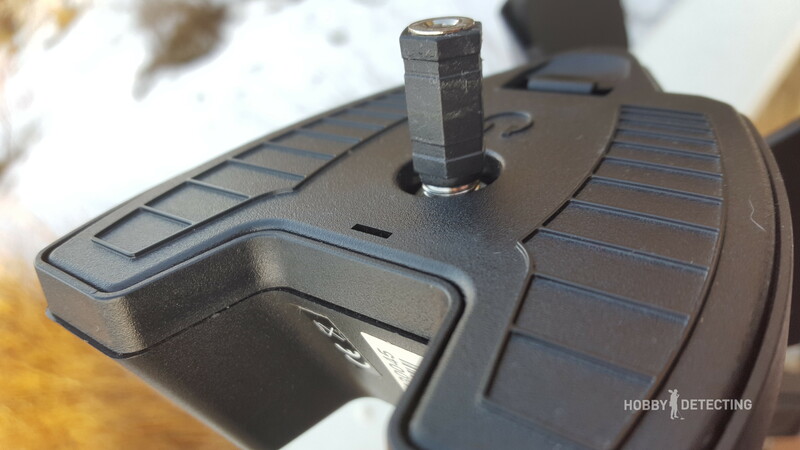 The F75 has a 1/4-inch (6.3 mm) headphone jack on the power block located under the armrest. For me personally, I had really good headphones that I wanted to use for detecting, but unfortunately, they had a 1/8-inch (3.5 mm) plug. But there was an easy solution for this: I went to my local hardware shop and bought a “1/8-inch to a 1/4-inch” (3.5 mm to 6.3 mm) adapter for the headphone plug so that it would fit the detector. These adapters are very common and they do not cost that much. You will also have to make sure that your headphone has a stereo plug because the mono plug will not work with the F75! As I mentioned earlier, you will save yourself some battery life when using headphones. But the main reason for using headphones is a different one. When using the headphones, you will much easier hear small and faint signals, and for me personally, the headphones have saved me from skipping a couple of silver coins! Another great feature that the F75 has, is the ability to save your settings. For example, if you have adjusted the detector settings for your liking, you will not lose these settings when turning the detector off, as you will on some other detectors. 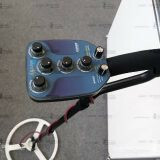 The display of the metal detector is very convenient, there is nothing superfluous. There is a backlit screen, undoubtedly useful and more than once. It is very convenient to perceive information on the display with the 2-numeric identification of the target with an inscription (iron, coin, etc.). The VDI numbers go from 0 to 99, and they are displayed right in the center of the screen. The metal range is divided into 7 groups, so that it is convenient to cut off a whole group of metals, for example, iron. On the bottom left you can see the “discrimination” mode with all of its functions. At the top left, you have the target depth indicator, as well as the confidence meter. By the way, the confidence meter can be really helpful! 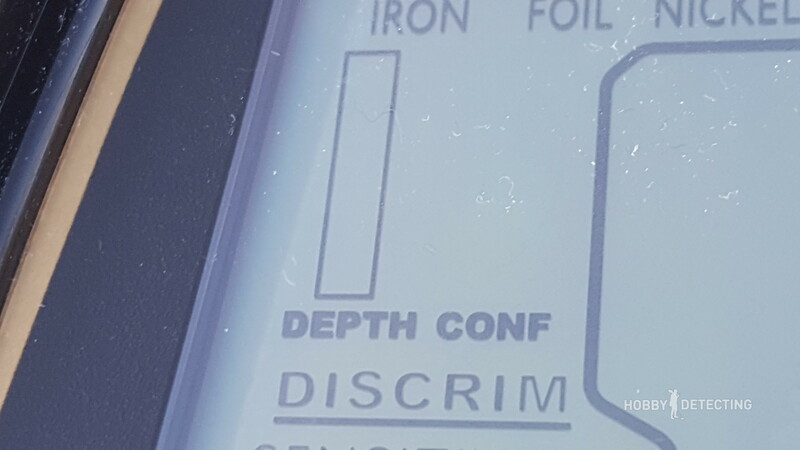 When I first got the detector, I was somewhat unsure of the usefulness of this meter, but after detecting for a while I found out that it was indeed really useful! The confidence meter shows you how confident the detector is in the given target ID, and this is often useful for differing between trash and good finds. The lower right displays the all-metal mode with its settings. On the top right you can see the battery level indicator and the amount of mineralization in the ground. The mineralization meter is good to see how mineralized the ground is, and from that information to adjust the detector. 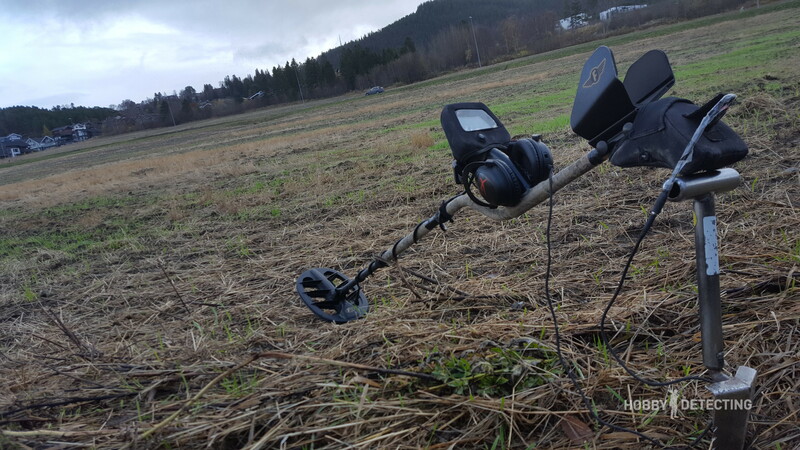 The F75 is well known for its depth, and among detectorists, it is known as a “depth monster”. 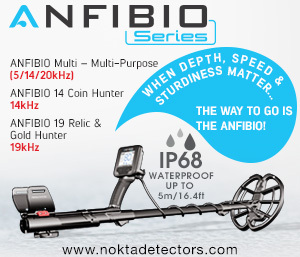 And now that so many detectorists are choosing detectors by their depth, many go with the F75. I can actually confirm that the depth of the F75 is incredible, as I have picked up coins from incredible depths. For example, I have a place where I used to detect a lot with the Garrett AT Pro and where I had a lot of great finds, including a golden ring. (Read the story about the story of this golden ring here!) And when I acquired the Fisher F75, I decided to give the earlier declared “empty” place by the AT PRO a chance. And believe it or not, my first good find with the F75 was a 50% silver coin! Later I went on to find a lot more coins and other good finds in that place. So from my experience, the Fisher F75 is an excellent detector for coins, rings, and other small relics. Now I must say that there was one more thing that pleasantly surprised me with the F75. The separation speed of the F75 is impressive, and this has saved me a couple of good finds. For example, I once was walking in the park when I got over a questionable signal. I checked the signal sideways, and it turned out to be a nice coin right next to a big rusty object! But now you maybe wonder, how good is the Fisher F75 for bigger relics, like war relics hunting? 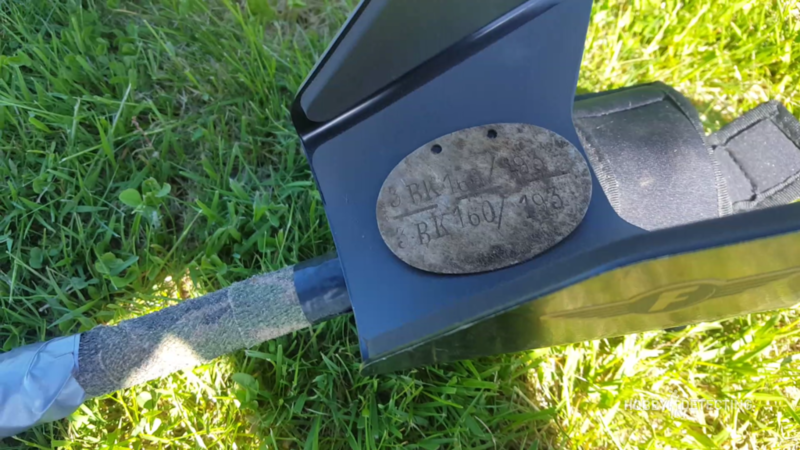 I have been detecting with the F75 in multiple WW2 spots, and I have had many good finds. Among other things, I have found four German dog-tags, Kriegsmarine buttons, a Mosin-Nagant rifle (read about the rifle here!) 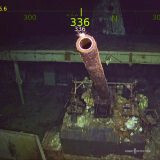 and many other WW2 relics with the F75. So to answer the question, it will definitely do the job for WW2 relics! You will also notice that when the coil of the F75 is over a large and shallow metallic object, it will give off an overload warning. The F75 is also claimed to work for gold prospecting, but I have never tried it for that purpose. I have tried the F75 on saltwater beaches, and if you have the right settings, it can actually be good for that: For saltwater hunting with the F75, set the sensitivity to below 30. Ground balance the detector manually in the All Metal Mode. And then set the detector to discrimination mode with a disc set at higher than 25. This will, of course, exclude the small golden chains and thin rings, but otherwise, the signal from the black and will be too strong and you will get many false signals. The standard coil on the F75 is an 11″ DD coil, which is a good coil and it will work for most purposes. This coil is waterproof, so technically there is no problem to go shallow water hunting with it. This coil will be good for most detecting purposes like coin hunting and so on, but to upgrade to a better coil will make the detector even better. For example, if you upgrade to a bigger coil, it will be much easier and faster to sweep a field. 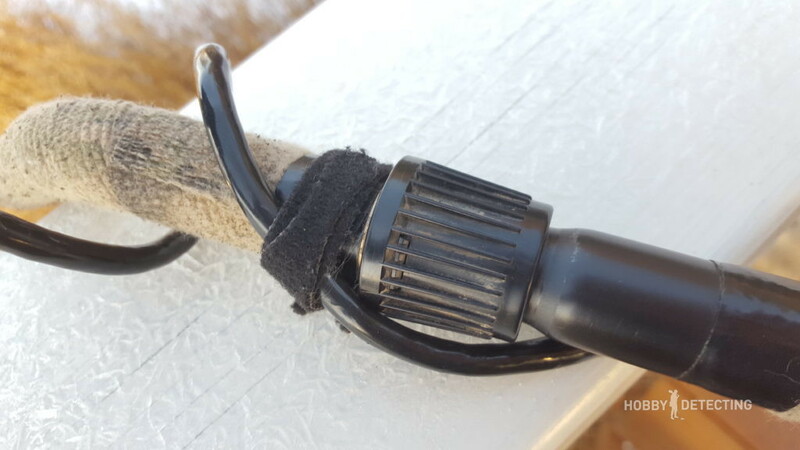 Or if you like to hunt in heavy littered places, then a small sniper coil will be perfect. For my F75, I use the Fisher tall camo backpack. This is a backpack made for the Fisher detector, and the F75 fits well inside this backpack with a lot of other stuff. I have written a separate post about the Fisher tall camo backpack and all of its features here! Like most others, you probably want to ask me this question: What is your best find with the Fisher F75? This is one of the most common questions, and not easy to answer. 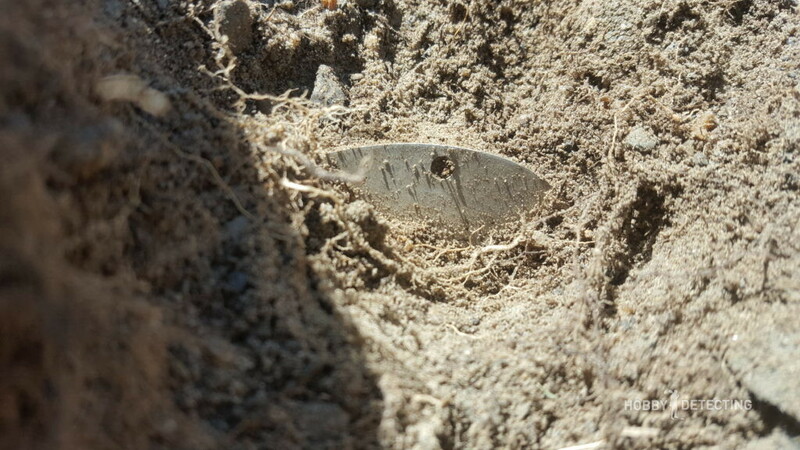 I have had a lot of good finds with this detector, so it will be difficult to pick out one specific find. This also depends if you think about the value or my personal favorite. Therefore I will only go on to tell you about two of my favorite trips with the F75: The day I beat my record for the oldest coin, twice! And: WW2 detecting with the F75! 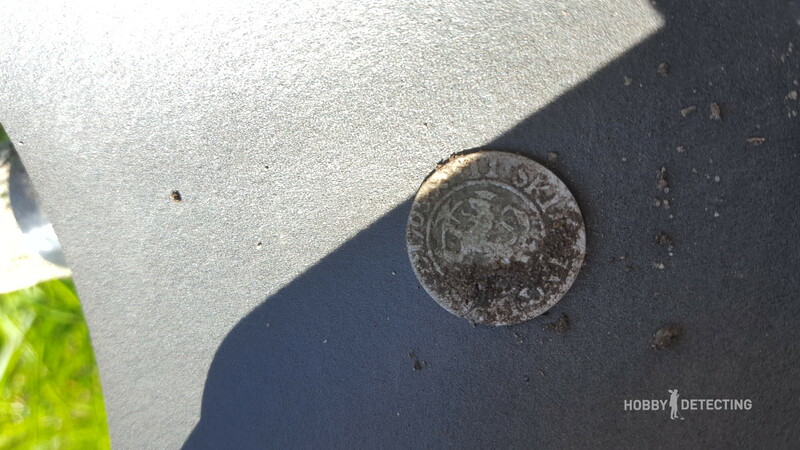 Other than that, I can also tell you about one of my most unexpected finds: a silver coin from the 1700s in a German WW2 position! Tip 1: Use rain covers! 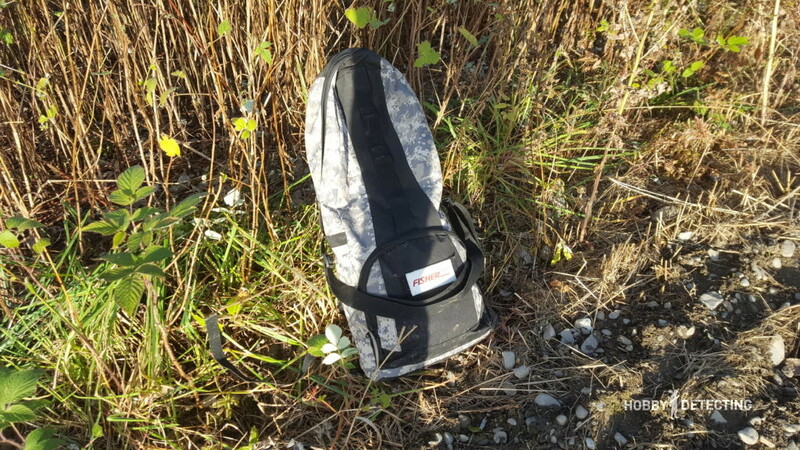 Although the F75 is a great detector, it is not waterproof. Therefore, I highly recommend to, at least, use rain covers on the battery compartment block beneath your elbow and for the screen. This will make everything much easier, as it is much better to just take off the covers and clean them instead of cleaning detector itself. This also protects it from any damage like scratches and so on. Tip 2: Do not set the sensitivity of this detector too high, because you will get quite a lot of false signals! This can be very irritating for some detectorists, especially for those who are relatively new to this hobby. Tip 3: If you get a lot of false signals with your F75 by just holding it up in the air, check the connector! This was a serious issue for me a couple of times, but it turned out to be a simple problem to solve for me. I just opened my connector between the coil wire and the main block and cleaned it with a cotton swab and a piece of cloth and the problem was gone! Tip 4: Clean the detector regularly! If you want to keep your detector good and functioning, remember to clean it every now and then! Tip 5: Wrap your detector in camouflage tape, as I have done with my F75. This will protect your detector and keep it in good shape. Tip 6: Use headphones. The F75 is a very good machine, and by using headphones you will use it to its full potential. 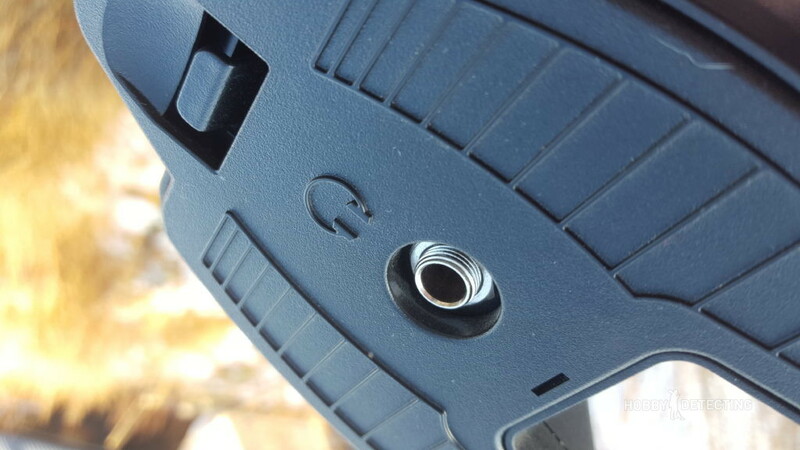 Tip 7: Use the included cable velcros to prevent any damage from being done to the coil cable. 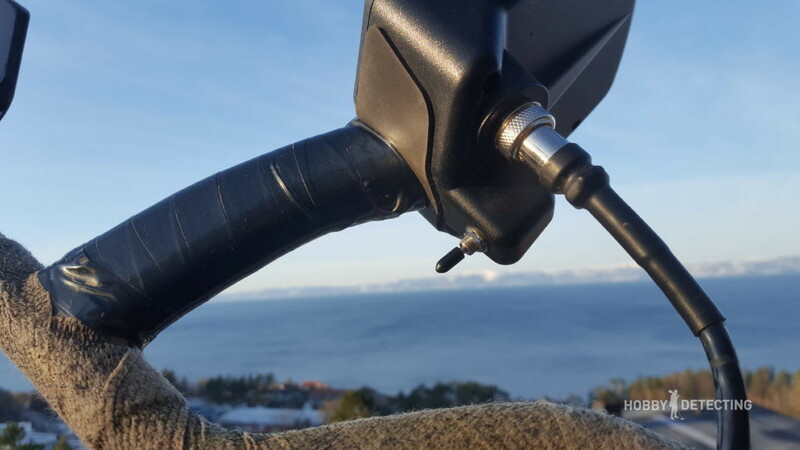 Tip 8: Wrap the handle of the F75 with electrical tape, as I have done. This will prevent the handle from being worn out and it will make the detector much easier to clean. In short, I have compiled the most significant pros and cons of the Fisher F75 detector, to sum up, my review. The F75 is a really lightweight detector for its class, and you can hunt for hours without getting tired. It has a good and reliable design, and it is well-balanced. The F75 has a many options and modern technology, and it is a professional class detector which will not disappoint you. It is especially great for finding small objects, like small silver coins and jewelry. 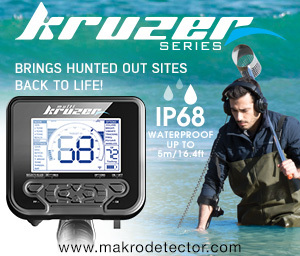 With its target response speed, it is good for searching in littered areas like parks. The F75 has a very decent depth, and I have found many coins with it on incredible depths! It may be difficult to learn for beginners, especially if you have little or no experience with detectors. This detector is quite a noisy machine compared to others. 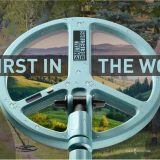 I have personally gotten used to it, but in the start, it may seem noisy for most detectorists. The locking collars are a bit tough, but that just may be something on my detector. As you can see, there are much more pluses than minuses, at least as I see it. That’s why the metal detector Fisher F75 is quite popular among diggers. What do you think about this detector? Maybe you are the owner of the F75 yourself? If you have any questions, I will be happy to answer them in the comment section below! For more about the F75, read here!